If customers or employees often complain that your business’ Wi-Fi is too slow, you aren’t alone as wireless demands have been higher than ever, and don’t show any signs of abating. But solving that problem may not just be about upgrading your wireless routing devices, or analyzing for interference of the signal. Instead, slow Wi-Fi might stem from the fact that customers just have too many devices, and your company needs more wireless access points to help them all get online. At least, that’s the solution to improving business Wi-Fi speeds offered by the people at Xirrus, a large-scale-wireless networking company. The company announced its new modular XR wireless array this week-- a unit that’s meant to solve slow Internet problems for high-traffic areas like warehouses, arenas, and hotels. Shaped like a large disc, the XR wireless array’s modular design allows for businesses to easily increase their wireless capacity by simply adding antennae to the wireless array (Xirrus hints that it’s array’s modules may even support cellular radios in the future), and reflects the exponential growth in demand for wireless in public places and businesses. According to a forecast measured by Cisco, a leader in the networking industry, the average U.S. citizen will own seven connected wireless devices by 2015. Needless to say, savvy business owners will have to find a way to accommodate all of that traffic. 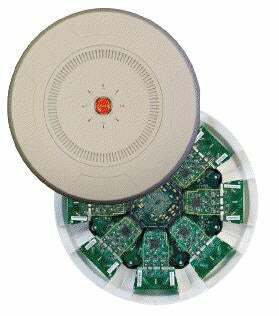 Wireless arrays like this one offer 8 access points for mobile data users. Xirrus, the company that developed the array, said they wanted to mimic the radios in cell towers. While many businesses have addressed this increase in mobile devices with a temporary solution-- adding more Wi-Fi units to an enclosed space-- this can be expensive and complicated to orchestrate for IT managers. Rather, Xirrus suggests that having one larger array with up to 16 access points could sufficiently address the needs of data-using customers and employees. Currently the company is offering their fully-loaded 16-access point XR chassis for $4000, although Xirrus says the chassis' modular structure will help potential buyers afford a model with fewer access points, in case small business owners would prefer to gradually grow into a fully capable Wi-Fi unit.